This sample form by the State of California is issued to parents who need to make a particular decision regarding their child’s medical care. The forms are to be filled up for medical emergency treatment. Crucial and sometimes heartbreaking decisions are made through such form, keeping in mind the best for the child. Some information about the allergies that a child has, are needed to be written down so that it does not coincide with the medicines or any kind of treatment given. If ever, a situation occurs where a child has to be taken away in an emergency, the doctors must know about the person as soon as possible. 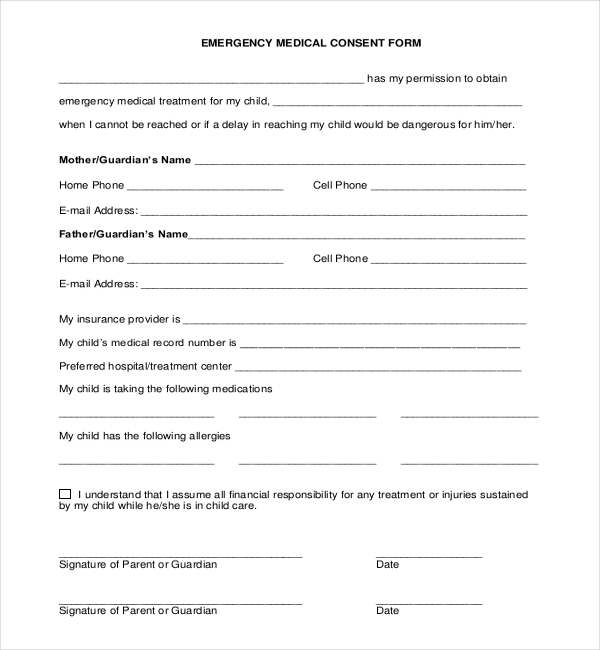 Filling up an Emergency medical consent form for a child would be a good option. One can quickly write down the important information regarding the child’s family and the child in this form and give to the hospital authorities to act upon it. For parents of the child living in Florida, need to take a look at the medical sample form. 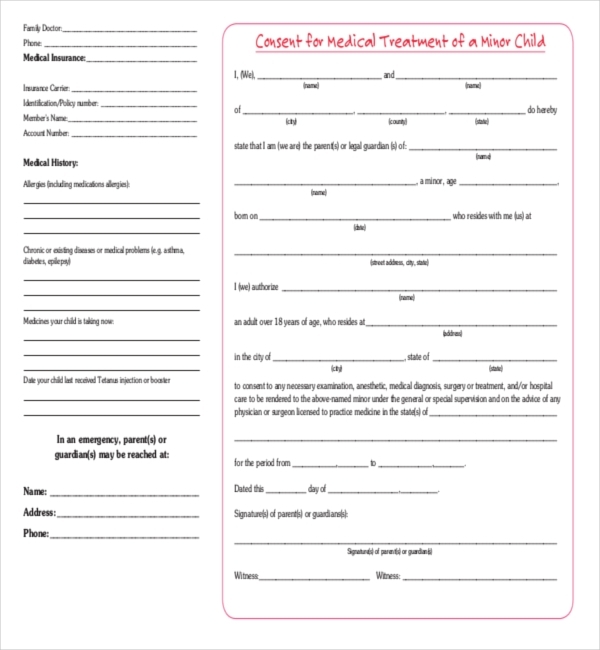 This form will help in giving the right treatment for the child in case anything goes wrong. This form needs the patient name and date of birth so that actions are taken appropriately. The minor child medical consent form is for those who have the urgency in getting treatment for the child in a proper way. 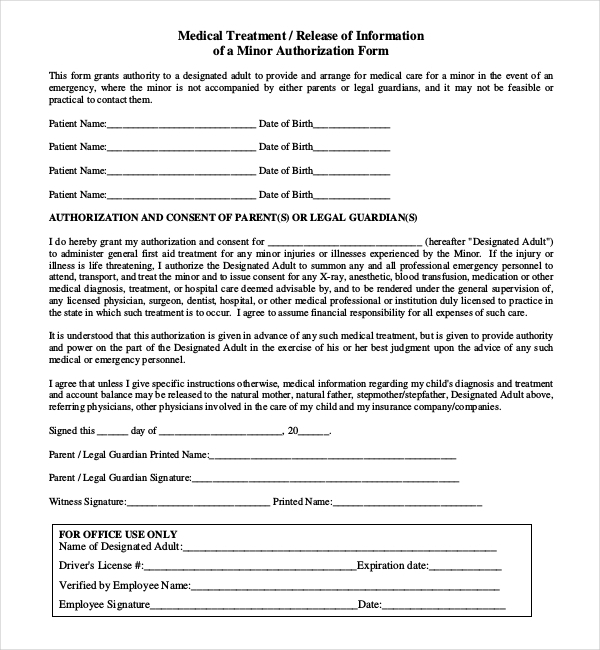 This medical authorization form needs the minor’s information. Apart from this, it also needs information for the treatment. The consent forms have a short paragraph dedicated to the legal approval of the child’s treatment. This works as a legal document for the child’s medication, equipment use and also the financial promise given to the hospital. The medical release and notarized child medical release form deals with the healthcare and medical declaration of the child. This form needs to be filled up duly and have a copy with you too, so as to be at a safer side. The medical consent form will automatically help in the treatment of the person as per the information given to the hospital authority. Alternate emergency numbers, postal address and signatures of the parents/guardian are required with the date. 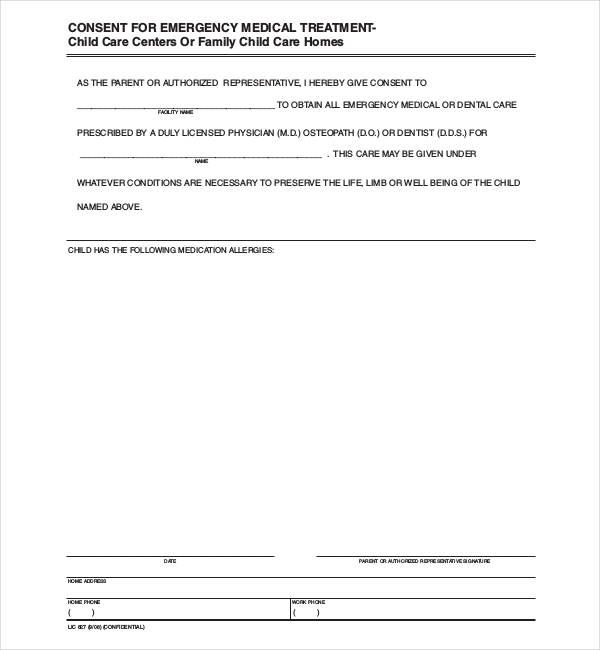 This simple child medical consent form for the parent or child who resides in Ohio requires the filling of the form by the child’s parents. This form clearly asks the authorization period, witness information and other miscellaneous information that is needed. These details play a vital part in a child’s treatment so that no misuse of power of the hospital authority takes place. The document plays a vital role in a family’s life. Any kind of machines used, medication given or decision relating to a medical platform needs to be accurately explained in a medical consent form. Those families or the children residing in Texas can use this consent form for better and smarter treatment. The child’s information like allergies, last tetanus, hospital insurance number, payment detail etc. are required to make the process quicker. 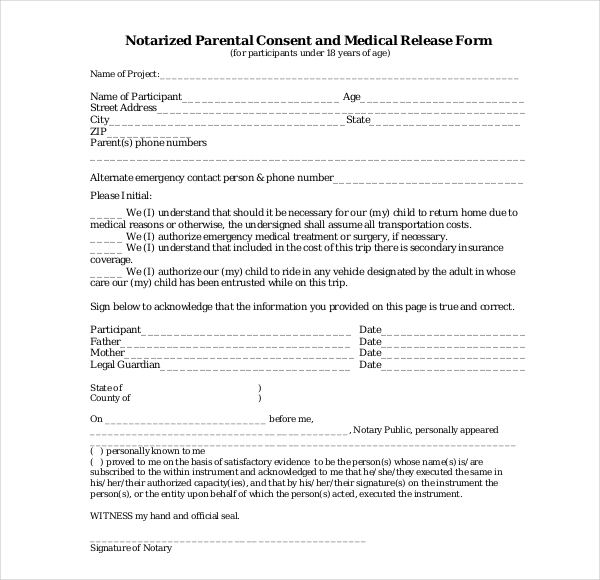 A child medical consent form while the guardians or parents are travelling is more than an important step on their part. This gives a security to the parents while they are out. Medical history, medical insurance, consent letter should be assigned. These forms are also kept for record purposes in case the same patient comes in future for any kind of treatment. The authorities can refer to it quickly and take actions accordingly. The forms are used for reference purposes. Any person who has come to the medical Centre or the hospital before will have a convenience of showing the medical consent form filled before in the present emergency. There is a scope of using these forms in the court. Physical proof is quite important. 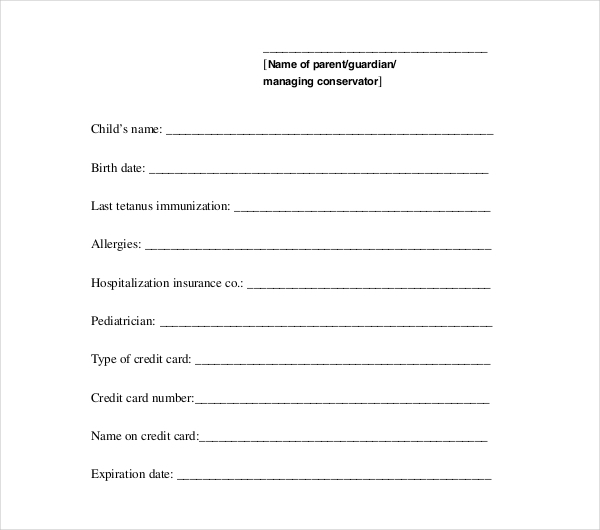 Prompt actions can be taken after filling these forms so that the doctors can make quick decisions accordingly. All the fields must be understood properly and then filled. This is important for the child in question. The forms must be filled with the correct information. Incorrect ones may lead to various problems. It may threaten a life as well. These forms are used for personal and medical purposes. Using these forms for some other purposes other than medical emergency will not serve the purpose. All the documents (if required) must be present. Many hospital authorities need it for verification purposes. Legible handwriting is advisable. It is important for the staff and the doctors. Some forms even ask to fill with a particular color like black or clue only. Implied Medical Consent Forms- Conditions where the patient is unable to communicate their consent at emergency situations have to use this implied medical consent forms. The forms have the implication that whatever is needed under such medical situation should be done. It is “implied”. For instance, when a heart attack takes place and the person is unable to convey consent in that situation, it is automatically taken that what to do next by the doctors. 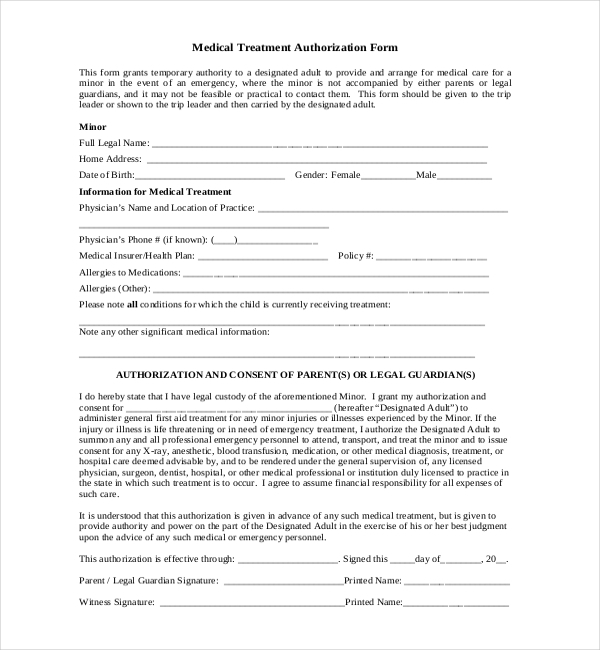 Third Party Consent Forms- if the patient is not in the mental state to get the depth of the procedure, a third person is asked to fill this form. This form can also be used if the person is refused to fill this form, and the third party has to fill it. Anyone who is withheld to fill a medical consent form, a third party has to fill the third party consent forms. The third party are mostly legal designate. For instance- parents or guardian of a child or a legal attorney delegated by the person him/herself. Thanks to the advancement in technology, you can now download and print these sample forms as per your wish. Our website provides all kinds of sample forms that are quite useful for all. You can get these forms in the form of PDF or Word. The forms can be edited as well. All you need to do is click on the download button and get them at your will. You would get these forms in the higher or lower compatibility versions. This makes it easier for our customers. The forms are made very carefully so that you do not have to edit it much, but still, if you need any further customization, we will gladly do so. These forms are completely error free, hence you can download and print them without any hesitation.